First, I wrote about the great small town food I discovered in Sedan, Kan. — population 1,200 — for you all here at the blog. Then I wrote about it for American Food Roots, this fabulous new site launched in the fall by four storied food journalists, one of whom happens to be my neighbor. The site’s unique focus is to tell the story of American foods, how they contribute to a sense of place in each state and how they have changed — and changed people — over the course of American history. You should go explore it. While you’re there, write up a bio and start participating in this food community that’s just beginning to percolate. 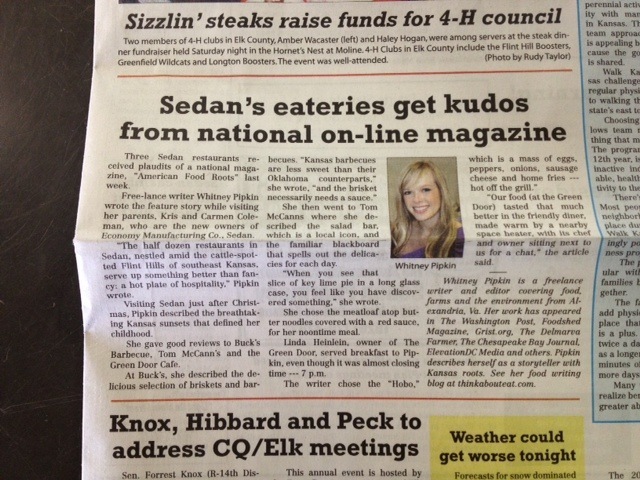 I love how the vision for AFR totally came alive with the story I wrote about small town eats in Sedan. People reminisced in the comments and made comments to my parents, who live in Sedan part time. Then, they did something unexpected. The Praire Star newspaper in Sedan, which I’m told is distributed to much of Chautauqua County, wrote up a front-page story about the story I’d written. With my picture and a lovely little bio to boot! My dad snapped a picture with his iPhone when he saw it yesterday, and it was just too cute not to share here. If you’re finding my blog via the story, then thanks for visiting! And thanks for living in such a cute town that’s so easy to eat in, read about and love.